Rakusan had believed that what would become World War II would not last very long. In anticipation of the return of tourists and other customers, Rakusan had continued to reprint his 100 Series and 36 Series designs until his money and supplies ran out. He was forced to close his studio operations in 1941 and find other work to support his family. Wartime was especially difficult for Rakusan because he became chronically ill and was frequently unable to work. However, despite his poor health and reduced circumstances, Rakusan had carefully preserved his accumulated back stock of finished woodblock prints and the wooden blocks he had used to print them. In the years immediately after the war it was impossible for Rakusan to resume his normal studio operations. Many of his accustomed supplies were no longer available at any price, and none of his prewar assistants were in a position to return to help him. Most importantly, Rakusan had not recovered his health. At times, he was well enough to reprint small batches only of his simple souvenir prints and winter cards. Sales of these attracted new customers who frequently bought copies of the larger designs printed before the war. With his children mostly grown and gone it was enough for Rakusan and his wife to live modestly. Although Rakusan had a very large backstock of finished prewar woodblock prints, supplies of several individual popular (or difficult to reproduce) designs were running out. Rakusan sold the last complete set of the 100 Series in 1947, and delivered it in early 1948. 1. Foster would act as a non-exclusive sales agent for original Rakusan woodblock prints, primarily to customers in the United States. 2. Rakusan would resume reprinting 100 Series and 36 Series designs. 3. In return for royalty payments Foster would publish and sell art reproductions of selected original prints. 4. Foster would publish a "book" about Rakusan and his woodblock prints. Walter T. Foster is primarily known for having produced inexpensive "How to Draw" booklets for amateur artists. Originally a one-person operation based in his garage, Foster self-published in 1919 his first of what was to become eventually a series of more than two hundred titles. Over the years Foster commissioned different artists to assist him in producing these booklets. Many of these artists became personal friends, and Foster included their works in an art collection in his home in Laguna Beach, California. Foster marketed the small Rakusan booklet as part of his existing "How to Draw" series, but unlike his other titles it only made a token effort at instruction. Of the twenty-seven different Rakusan designs included, only four were actually used for brief drawing demonstrations. Instead the booklet was primarily a promotional tract for Rakusan's art and served as a sales catalogue for some of the original woodblock prints and reproductions sold by Foster doing business as Foster Art Service, Inc. Contrary to implications in previously published reports (notably Merritt and Yamada 1992, see endnote below *), Rakusan did not write, produce, publish, sell, or distribute this booklet. It and the machine-printed reproductions were Foster enterprises for which his company paid Rakusan (and later Rakusan's family) regular royalties as long as the reproductions were sold and the booklet was in print. The booklet was obviously hastily prepared, and the inexpensive printing process meant that the quality of the reproductions was poor and not faithful to the colors of the original woodblock prints. As a result, Rakusan was acutely disappointed with the booklet and did not retain, display, or mention it in his home. What Rakusan had wanted and expected as a Foster book was a catalogue raisonné including a brief biography. By 1950 Rakusan had prepared a pasted-up scrapbook manuscript version of the book he hoped would be printed. It contains several personal photographs and notes and examples of his work. Most importantly every woodblock print in the 100 Series and the 36 Series is illustrated and numbered in consecutive order of first publication. Marginal notes added in early 1951 indicate Rakusan's frustration and disappointment that the book he had so wanted was not to appear. Nevertheless Rakusan permitted Foster to scale back the book project to what became the Foster booklet. Foster selected copies of twenty-four 100 Series prints from his own collection to serve as the primary illustrations in the booklet. Foster also prepared the brief drawing instructions and provided captions and a minimal commentary. Foster solicited additional material from Rakusan specifically for inclusion in the book. Some of this, including the three process sets, had to be produced specially for that purpose; even though by this time Rakusan was finding working in the studio increasingly difficult because of his failing health. The booklet is not overtly dated, but it can only have been assembled during a rather brief period just prior to the final closure of Rakusan's studio in 1955, probably circa 1954. The included text was clearly written while the studio was still open. Another important consideration is that perhaps a third of the booklet illustrations are of edition III copies of 100 Series designs (see below). Such a large percentage of edition III copies suggests the later part of the postwar printing period. This estimated timing is due to a misunderstanding. Rakusan apparently dated his professional career from the beginning of his apprenticeship to Takeuchi Seiho in about 1913. Rakusan recorded elsewhere that he did not begin planning his 100 Series until about 1925, with the first prints appearing in 1929. Therefore, the Foster estimate must refer to the beginning of Rakusan's career rather than to the beginning of this print series. Adding forty years to 1913 would be circa 1953. If these statements are taken literally, the Rakusan booklet could have been composed about 1958 (from adding thirty-nine years to 1919). However, Foster, like Rakusan, would have included preparation time before the date of his first publication in his career total. 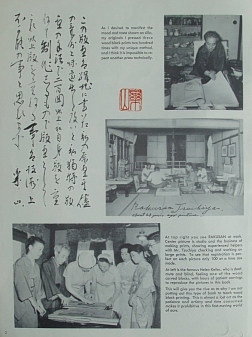 An often-reprinted picture of Rakusan in his studio appears as the center photograph on page 2 with the addition of a unique annotation in Rakusan's own English cursive handwriting, 'Rakusan Tsuchiya, about 23 years ago picture'. The top photograph on page 2 shows a somewhat graying Rakusan seated in his studio leafing though a stack of 100 Series prints. The Foster caption reads: 'At top right you see RAKUSAN at work.' Although the first edition original of the print design in the stack dates from about 1932, because Rakusan appears older than in the first photograph, the prints shown have to be from back stock or from a later reprinting. Rakusan's appearance is very like that in the next photograph and both may have a similar post-World War II date. The shelving unit in the background is not the same one shown on the left wall of the previous photo, but the shelf contents and other implements shown are very similar, if not identical. This shows that Rakusan was still actively working in his studio at the time, and it therefore had to have been taken before the final studio closure in 1955. The bottom photograph on page 2 shows Rakusan, his wife, and three of their children, all in traditional Japanese costume, displaying a wooden printing block to Helen Keller and her companion Polly Thompson. The photograph was taken in one of the public rooms of the Miyako Hotel in eastern Kyoto on October 11, 1948. At the time of this visit Japan was still occupied by United States forces. Miss Keller was such a high profile and important visitor that the occupation forces refused permission for her to meet Rakusan at his studio. Therefore Rakusan took his family and these woodblocks to the hotel where Miss Keller was staying. The Foster caption reads: 'At left is the famous Helen Keller, who is deaf, mute and blind, feeling one of the wood carved blocks, with hours of patient carvings to reproduce the pictures in this book.' The large size of the blocks indicates that they are from the 100 Series, but an exact design has not yet been identified. The Foster booklet is known in many slightly different versions, but the content applicable to Rakusan is identical in all of them and occurs in only two formats. The original editions include sales and production information on each of the illustrated Rakusan designs as a single list on the inside of the back cover (page 31). At some point shortly after the introduction of United States postal ZIP codes in 1961, Foster revised the postal addresses on page 31 and on page 2. He also took this opportunity to modify the formatting slightly. The information specific to each design was moved to the same page as its illustration. The general ordering instructions for Rakusan prints and reproductions were moved to the top of the inside front cover (page 2). Those relocations permitted Foster to substitute a full list of his available publications into the vacated space on page 31. The many subsequent editions revised and updated only this Foster publications list. Note that the information regarding the sales offerings of Rakusan designs was never again modified, even after such purchases were no longer available through Foster. The Foster booklet is important as the only source for the exact number of printing impressions needed to complete any specific Rakusan design. All colored woodblock prints require many different printing impressions to complete the finished designs. The more design complexities, colors of ink, and application techniques; the more impressions that are needed. The total number of wooden blocks required is usually much smaller than the total number of impressions since different areas of the same wooden block may be reused to print different colored areas on the sheet of paper. Also the same raised areas of the blocks are typically reused successively to build up the complex composite colors, bokashi shading, and other special effects, including adhesives for glitter enhancements. On page 6 regarding 100 Series design 12: ‘…Rakusan used 200 printings or operations to do this one...’. On page 16 regarding 100 Series design 5: ‘This original block print has 220 hand-operations or printings, ...’. Elsewhere in the booklet the number of impressions is indicated only with the number and the word ‘printings’, e.g. again for design 12 elsewhere on page 6: ‘200 printings’. 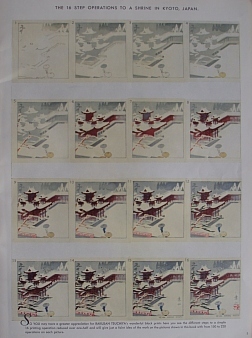 The small Heian Shrine winter card design WC5 used as an illustration of woodblock printing technique required at least the 16 different impressions depicted in the illustrated process set on page 3. The two 36 Series designs are reported to have used 32 and 37 impressions, but illustrations of just four stages of each are illustrated as representative process sets on pages 8 and 9. Of the twenty prints from the 100 Series for which impression numbers were reported, seven used 120-130 impressions; five used 150-180 impressions; and eight used 200-220 impressions. Foster had encouraged Rakusan to let him act as a non-exclusive sales agent for original Rakusan woodblock prints, primarily to clients in the United States. Initially, the idea had been to sell copies from Rakusan's back stock of prewar woodblock prints. However, it soon was discovered that in order to provide sufficient inventory of particular designs for Foster to advertise and sell, Rakusan would have to resume reprinting his 100 Series and 36 Series designs. Although reluctant because of his unreliable health, Rakusan eventually agreed to reopen his studio, primarily with financial support from sales to Foster. As outlined in the booklet, Foster was to sell the original Rakusan woodblock prints at $25.00 each for the 100 Series and $6.00 each for the 36 Series. (These were quite expensive for the time, and the equivalent values in 2017 dollars are $225 and $54.) The original image dimensions were usually listed in the Foster booklet as (13" x 18") and (9" x 14") respectively, but the actual dimensions could vary by up to an inch in the larger size prints. Foster also had convinced a reluctant Rakusan of the desirability of personally adding an English (romaji) signature to each print Foster sold (even though they were already signed in Japanese). This allowed Foster to advertise that the prints were 'autographed by RAKUSAN' in a manner his typical Western clients could recognize. Including the signature within the image area ensured that the attribution would remain visible when framed and would thereby continue to provide indirect advertising. Rakusan applied this romaji signature only to small batches of prints intended to be sold through Foster. Even though a few copies signed that way were sold directly by Rakusan, and others remained unsold; the presence of this signature is a reliable marker for the era of the Foster sales. Foster (and others) had been very keen on having Rakusan resume reprinting all of the sold-out designs so that they could complete their own collections of full series sets. Still working by himself, Rakusan had no intention of attempting to reprint the most difficult 100 Series designs (which he had also not reprinted with a full staff in his prewar edition II). However, Foster and the others were hopeful. Rakusan remained too ill to work fulltime in his studio, but he nevertheless handled all of the postwar reprinting by himself. 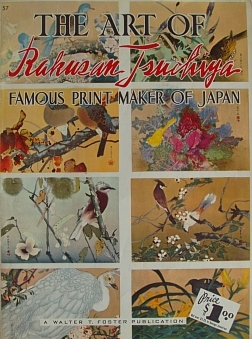 At intervals during the period between 1948 (at the earliest) and 1955 Rakusan was able to produce small reprint runs of many previously sold out designs. These included all of the edition III reprintings of 100 Series designs, some reprinted designs in the 36 Series, and at least five process sets. As mentioned, several of the illustrations in the Foster booklet are of edition III copies. From the relatively large number of currently documented copies with romaji signatures, Foster sales of original Rakusan woodblock prints were very popular. Although the Foster sales provided much appreciated financial support, Rakusan always had mixed feelings about his postwar major series reprintings. Postwar reprinting was an opportunity for Rakusan to make some desired changes, notably correcting an inversion in design 22, and using a more technically sophisticated bokashi to improve several other designs, including the well-known designs 86 and 108 reprinted in the booklet. However, many of his preferred materials were no longer available, and Rakusan did not really like the results from most of the substitutions. Then, too, working alone while ill meant that operations requiring a second set of hands had to be modified or omitted. Rakusan felt that all of his postwar efforts were not up to the standards of his earlier, prewar prints; and they were generally disappointing to him. Today what mostly appear for sale as reproductions of Rakusan woodblock prints are pages sliced from the Foster booklet. Those images, although attractive, are nowhere near the quality of the separately sold fine art reproductions. Foster was licensed to print in the United States, and sell directly, different sizes of high quality photolithographic reproductions of the original Rakusan woodblock prints Foster was offering for sale. As noted, by this time the original prints were rather expensive, and Foster wanted to offer his clients less costly alternatives which were nevertheless still frame-worthy. Foster doubtless expected that this would increase Rakusan's exposure which in turn could lead to additional business. Rakusan was to have no part in this operation, but he would receive royalty payments from the sales. The four-color photolithographic reproductions were to be produced locally in California and mailed to the Foster customers from his warehouse. Surviving copies show that the machine-printed colors were very carefully matched to the originals and that the printing quality was very high – equivalent to fine museum reproductions sold today. Unlike the booklet whose illustrations were printed on semi-gloss paper, the fine art reproductions are on paper with a matte finish. Foster described the reproductions as printed on 'heavy paper' (p. 16). Each of the reproduced Rakusan designs were only offered in a single (typically reduced) size. The booklet listed that one design was reproduced at nearly original size at (13" x 18") for $6.00 each; sixteen others at roughly (9" x 12") for $3.00 each; and three others at roughly (7" x 9") for $2.00 each. (These are equivalent to $54, $27, and $18 in 2017 dollars – again still relatively expensive for the time.) Except for three designs illustrated in the booklet which were cropped on all four sides, the booklet illustrations and the fine art reproductions retain the proportions of their original woodblock prints. With the one exception noted below, all of the documented reproductions are of the exact same copies from Foster's personal collection which are illustrated in the booklet. At some point at least one additional design not illustrated in the booklet was issued in a greeting card format similar in dimensions to the smallest size reproductions. Some of these greeting cards are known to have been machine-imprinted with personalized messages. However, it is not known if they could be ordered customized, or if the personalization was added by another printer after purchase. Some card-size reproductions are known to have an accompanying thin tissue sheet. This insert had printed data on Rakusan and on the design depicted. A similar, larger sheet accompanies some of the other reproductions, but it is not known if all originally had them. The exact dimensions of these accompanying sheets are not known for certain, but all known examples are smaller than the paper containing their associated reproductions. Today the Foster fine art reproductions very seldom come up for sale, and no significant collections of them are documented. It is entirely possible that there were never many copies sold, and it is likely that most that were sold were considered ephemera and have not survived. In 1955, not long after the Foster booklet was first published, Rakusan closed his studio for the last time. Since he still had considerable back stock inventory of both prewar and postwar woodblock prints available, the studio closure would not immediately have affected his ability to provide prints for Foster to sell. Their initial distribution plan was that Rakusan would send the original prints directly from Japan to the Foster customers, but that practice soon became too physically difficult for Rakusan to handle. For a while thereafter Rakusan sent small batches of prints to Foster in advance of expected sales, and later Foster collected additional batches in person on his frequent trips to Japan. Except for that short initial period Foster handled all aspects of sales and shipping to the customer. There had previously been other temporary work stoppages since the war, and it is likely that both men initially hoped that Rakusan would again be able to resume work. However, Rakusan never sufficiently recovered his health, and the closure became permanent. Foster visited Rakusan often, and once made a special trip when Rakusan was seriously ill.
Rakusan continued to sell prints to visitors to his home intermittently through the early 1970s, but the sales of prints through Foster had been halted some years previously. Nevertheless, Foster kept the booklet in print and paid royalties on it to Rakusan, and later to his family after Rakusan died in 1976. After Foster died in 1981, his heirs ran the business for a while before selling it outside the family in 1988. At that time the new owners ceased reprinting almost all of the back titles, including the Rakusan booklet. The present Walter Foster Company no longer has any contact or connection with the Foster family (or with Rakusan), but it still continues to sell similar art books as a subsidiary of a larger printing company. Although long out of print, Foster's Rakusan booklet was printed and reprinted in such large numbers for over at least thirty years that it is still widely available today; usually for between $5 and $10 for an intact copy in good condition. Note that not all of the Rakusan original woodblock print designs sold by Foster are illustrated in booklet #57. For example, although only two 36 Series designs are illustrated in the booklet, there are at least some copies of half of the designs in that series which include added Foster-style romaji Rakusan signatures. Also, as noted above, at least one reproduction not mentioned in the booklet was also produced. There had to have been more sales lists and business records including additional Rakusan designs sold by Foster which hopefully remain to be discovered. Less than half of Foster's reported Rakusan collection has yet been documented. Unfortunately, the fate of that collection is unknown, and apart from the booklet there is no known list or catalogue of any portion of it. If anyone has information to share about Rakusan designs in the Foster collection, Foster business dealings with Rakusan, or any Foster reproductions not illustrated in the Rakusan booklet, please contact us. B. 1886 [sic]. Worked in Kyoto. Many self-published kachō prints. Also used the name Rakuzan Kōshisei. In early 1950s sold his works along with a how-to book entitled The Art of Rakuzan [sic] Tsuchiya, Famous Print Maker of Japan through Foster Art Service, Inc. This brief entry has two serious typographical errors: Rakusan's birthdate is 1896 (not 1886); and the booklet title is incorrectly cited with his name spelled "Rakuzan" instead of the original "Rakusan" (which was also his preferred transcription throughout his life). In addition to the Foster booklet, Merritt and Yamada 1992 is the only other generally available published information about Rakusan prior to the posting of the Rakusan.net website.